This rumor has been brewing for a while and last night it officially was confirmed. Rob McElhenney (comedic star of It’s Always Sunny in Philadelphia) made a cameo appearance on the Season 8 premiere of HBO’s Game of Thrones. Those who were unaware of the rumors might’ve missed it because it happened very quickly. However, the scene was rather significant for the show and it was a well-placed cameo. Curious about which character the Always Sunny star played? Here is what to know about his Game of Thrones cameo and what scene he appeared in for the show. What character did Rob McElhenney play on Game of Thrones? Warning: Spoilers ahead for Game of Thrones Season 8 premiere. The scene occurs halfway through the episode during a quiet nighttime setting focused on Euron Gravejoy’s ship. As the scene fixates on Euron’s men, stretching of a bow is heard, and one of the men gets impaled straight through the eyeball by an arrow. The first man to be shot is Rob McElhenney himself and if one were to blink it would easily be missed. Soon after, it’s revealed that the people shooting the arrows are Theon’s men coming to rescue Asha. Unfortunately, Rob McElhenney’s character was collateral damage for Euron imprisoning her but that was a killer easter egg of a cameo regardless. The actor even confirmed his appearance via Instagram saying, “Don’t blink” with a screenshot of his character’s demise. Check out the tongue in cheek post below from Rob McElhenney himself. Of course, this is not the first time Game of Thrones had cameos in its epic run. Ed Sheeran made an appearance last season and actually sang a little. Recent academy award nominee Richard E. Grant made a small appearance in Season 6. Not to mention, the great and wonderful Ian McShane had a run-in with The Hound back in Season 6 as well. 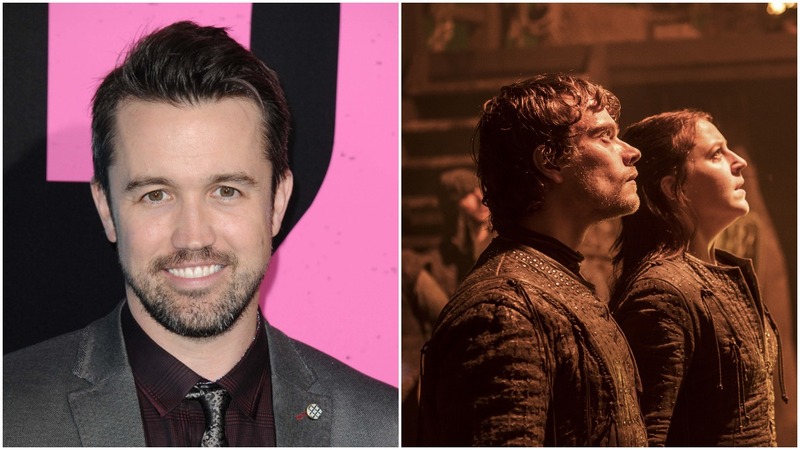 Rob McElhenney now joins the list of fun cameos on Game of Thrones and his appearance just adds to the number of reasons to rewatch the season premiere. Game of Thrones airs on HBO Sundays at 9/8 CST and It’s Always Sunny Philadelphia Season 14 is expected later this year.